M/E Engineering employs sophisticated CFD models that code officials and design professionals can use to determine the impact of potential fires and smoke on various building designs. CFD analysis allows us to accurately calculate the growth of a fire, smoke development and smoke dispersion into a building, atrium or other inhabited space. Because the studies are transient in nature, fire and smoke modeling can be used in conjunction with predicted egress times to demonstrate the safety of a building’s design for its occupants. Additionally, information from the study allows engineers to "right-size" the smoke mitigation system and its duct work. A significant reduction in air handling requirements is often achieved through the use of CFD models as compared to other techniques, and the results are acceptable proof of design for fire marshals and code officials. The output may be shown as either individual figures over time or as an animated sequence where the detailed results of the analysis can be presented as 3D color output of the building that graphically depicts the effects of a fire, including temperature, smoke dissipation and visibility. 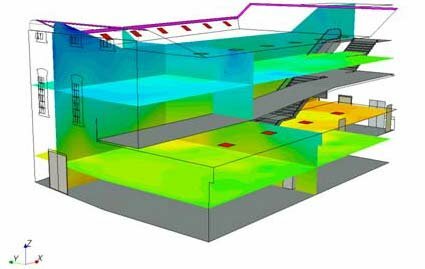 CFD analysis of the effects of smoke and fire on interior spaces. Determination of egress time during a fire event. Right-sizing of smoke management systems.